This article describes how to add a reference data set to your Azure Time Series Insights environment. Reference data is useful to join to your source data to augment the values. A Reference Data Set is a collection of items that augment the events from your event source. 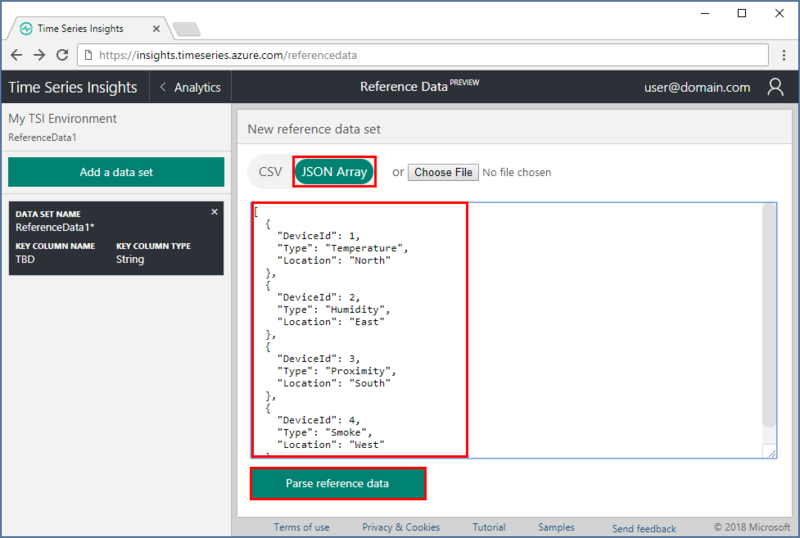 Time Series Insights ingress engine joins each event from your event source with the corresponding data row in your reference data set. This augmented event is then available for query. This join is based on the Primary Key column(s) defined in your reference data set. Reference data is not joined retroactively. This means that only current and future ingress data is matched and joined to the reference date set, once it has been configured and uploaded. 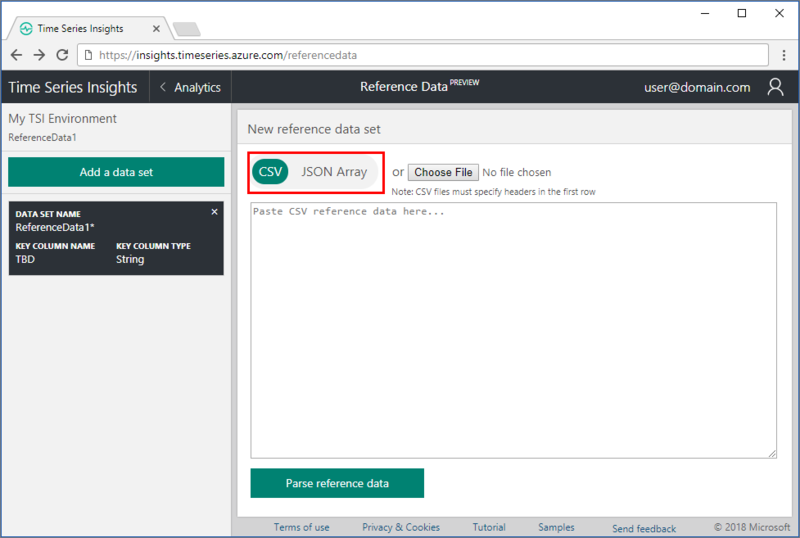 In this video, we cover Time Series Insight’s reference data model. 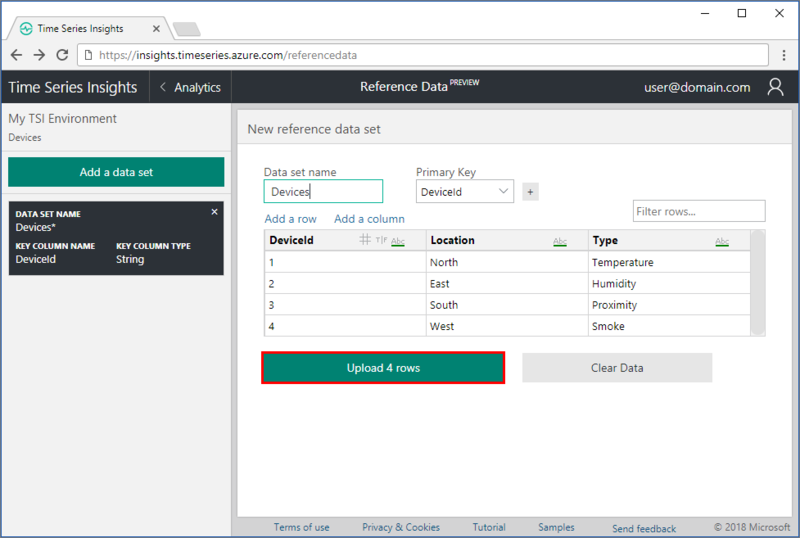 Locate your existing Time Series Insights environment. Click All resources in the menu on the left side of the Azure portal. Select your Time Series Insights environment. Select the Overview page. Locate the Time Series Insights explorer URL and open the link. View the explorer for your TSI environment. Expand the environment selector in the TSI explorer. Choose the active environment. Select the reference data icon on the upper right in the explorer page. Select the + Add a data set button to begin adding a new data set. Choose CSV for comma-delimited data. The first row is treated as a header row. Paste the data into the text editor. Then, select Parse reference data button. Select Choose File button to add data from a local text file. If there is an error parsing the data values, the error appears in red at the bottom of the page, such as CSV parsing error, no rows extracted. Once the data is successfully parsed, a data grid is shown displaying the columns and rows representing the data. Review the data grid to ensure correctness. Review each column to see the data type assumed, and change the data type if needed. Select the data type symbol in the column heading: # for double (numerical data), T|F for boolean, or Abc for string. Rename the column headers if needed. The key column name is necessary to join to the corresponding property in your event source. 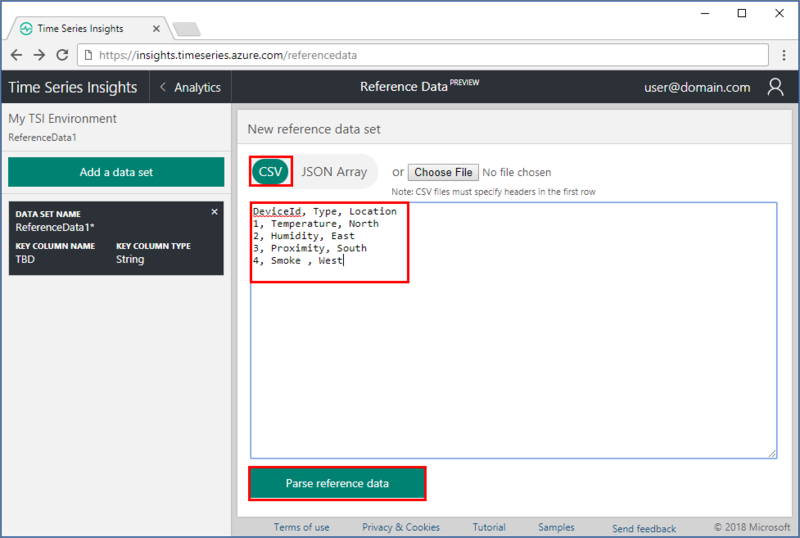 Ensure that the reference data key column names match exactly to the event name to your incoming data, including case-sensitivity. The non-key column names are used to augment the incoming data with the corresponding reference data values. Click Add a row or Add a column to add more reference data values, as needed. Type a value in the Filter the rows... field to review specific rows as needed. The filter is useful for reviewing data, but is not applied when uploading the data. Name the data set, by filling in the Data set name field above the data grid. Provide the Primary Key column in the data set, by selecting the drop-down above the data grid. Optionally, select the + button to add a secondary key column, as a composite primary key. If you need to undo the selection, choose the empty value from the drop-down to remove the secondary key. To upload the data, select the Upload rows button. The page confirms the completed upload and display the message Successfully uploaded dataset. For the complete API reference, see Reference Data API document.